owner. It’s the ideal accommodation for dynamic travellers who enjoy discovering for its own the surrounding area and relax in the evening in a quiet, warm and family atmosphere. Located in the heart of Costa Smeralda, Stazzo Lu Ciaccaru is a few Kilometres from the most beautiful northern Sardinia beaches. The hotel is less than 2 km far from Arzachena and about 20 km far from Olbia Airport. From the Hotel you can easily reach some of the most important historical and archaeological sites of Gallura. Stazzo Lu Ciaccaru has been created according to the traditional Gallura farmhouse style and is surrounded by the scents of myrtle, juniper and arbutus, within an estate of 32 hectares. It consists of several parts: the villas (the Stazzo, which dates to 1850 and was recently restored and Il Pagliaio, born from the enlargement and the renovation of the old barn), the rooms and the Suites. 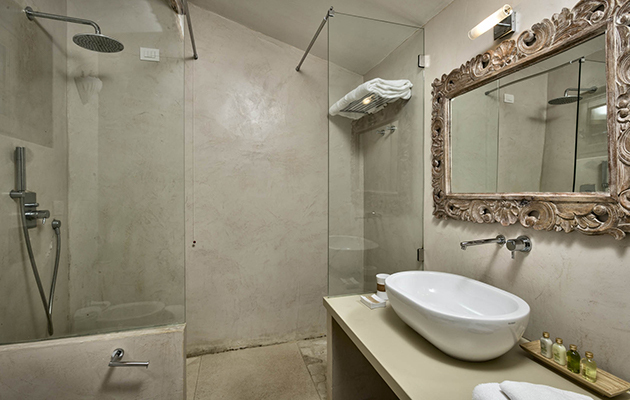 The two rooms of Stazzu Lu Ciaccaru are located near the reception. They are equipped with all amenities, including the closet and bathroom with Jacuzzi shower. The 10 suites are surrounded by the nature and have a comfortable covered patio to relax during the day or to enjoy the cool evenings. Very spacious, they have been furnished using the typical local materials such as granite, wood and brick. The Stazzo renewal comes from the ancient structure, which still keeps the traditional charm. It consists of three double rooms with private bath (one of which has separate entrance), a fully equipped kitchen, a living room-dining room with fireplace, a covered porch. The veranda overlooks the solarium of the swimming pool, immersed in the nature of Gallura. The Pagliaio is furnished with antiques. Il Pagliaio is divided into several rooms: a bedroom and a bathroom with shower and whirlpool tub, living room with fireplace and dining room, bathroom with shower and whirlpool. Upstairs there are two other bedrooms and a bathroom with shower. To taste the local dishes, guests can dine at the restaurant of the hotel, which also offers tasty Mediterranean dishes. Guests accommodated in the Suites and in the Villa Il Pagliaio have free access to the beautiful outdoor pool (opened from 1st may to 30 september). It is also available a comfortable solarium, equipped with sun loungers and sun umbrellas. Dipped in the garden, the Suites are large and guarantee privacy and relax. They consists of double bedroom, living room with sofa bed and bathroom with shower and hairdryer. The Suites have a private equipped covered veranda with a relaxing greenery view. 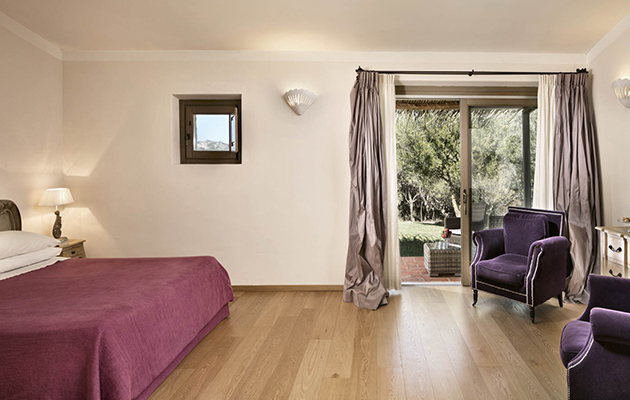 Located near the reception, the Superior rooms are equipped with all amenities, characterized by the traditional Gallura farmhouse style and by a welcoming atmosphere. They consists of double bedroom, walk-in closet and bathroom with Jacuzzi shower and hairdryer. 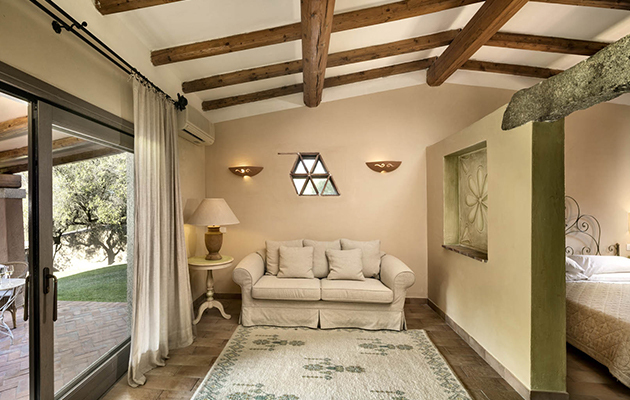 Dipped in the garden, the Junior Suites are large and characterized by the typical old country house style and features wood, rock and granite details. They consists of double bedroom, living corner with armchairs and bathroom with shower and hairdryer. The Junior Suites have a private equipped veranda with a relaxing greenery view. The Superior Suites are furnished with the taste of an old country house, they are spacious, comfortable and offer a panoramic view. They have bed room with double bed and a living area with two single beds and a large bathroom with shower, hairdryer, complimentary toiletries and slippers. The interior has soft lighting and fine silk curtains “chantun”. 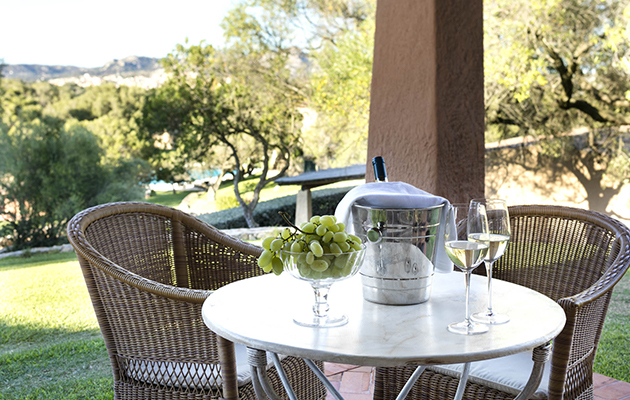 The private veranda is furnished with outdoor furniture. The Superior Suites offer air conditioning, heating, minibar, LCD TV, free internet access and armchairs. Special for Charming customers: a bottle of Torbato!